En nyutgiven bok om det senaste om hälsa och sjukdomar hos Reptiler och amfibier. Burleigh 2014, sc., 176 pages, 240 colour photographs. 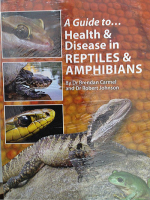 The latest release in the successful series “A Guide to Australian Reptiles and Amphibians in Captivity” covers diseases of australian herps in captivity. A major part describes necessities to avoid diseases, but also diagnoses (on which the focus of the illustrations is) and therapy are described in detail and with a lot of practical experiences by Dr Brendan Carmel BVSc MVS MACVSc & Robert Johnson. BVSc MACVSc.